Polio or Poliomyelitis, often called infantile paralysis is according to the WHO (World Health Organization), 1 out of 200 victims can experience permanent paralysis. The two types of poliomyelitis are the one that involves the central nervous system and the one that does not. The two vary in condition and the most common minor symptoms are upper respiratory tract infection, nausea, abdominal pain, vomiting, diarrhea, etc. Because of these conditions, this disease alarms everyone and studies are carefully done in order to learn more and discover the ways on how to prevent this disease. The most common age group that is affected with polio is the children less than 5 years old. Normally, the virus attacks the nervous system, though there are two types as what is stated at the top. This disease is highly contagious. And this is through intestinal source and oropharyngeal source. Those who have immune deficiency and problems on the bone will most likely to acquire this disease and malnutrition is another factor. Vaccine is the best guard for polio. Because of high technology and innovation in terms of medical procedures, outbreak of this kind of disease is prevented. Another precaution is the closing of swimming pools especially if the area is affected. This is in order to avoid infection. Diagnosis of the said illness is done by examining the stool of the patient and swab of the pharynx. Another thing is that the CSF (Cerebrospinal Fluid) is also done in order to check the level of white blood cell and protein level. If the virus is detected in the CSF, this could help in the diagnostic of the disease. 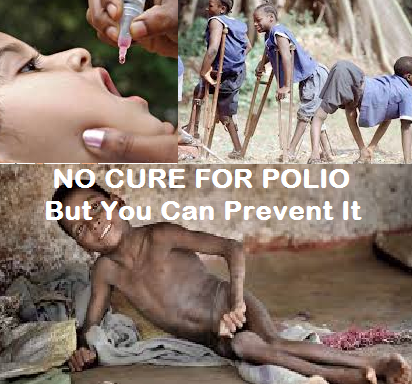 There is NO cure for polio. Until now, the specialists in the medical field are still conducting researches and experiments in order to find an antidote for this long term disease.